Guy Edlund has been a volunteer with CFCR for over eight years, and has been an integral part of our organization on several different levels. 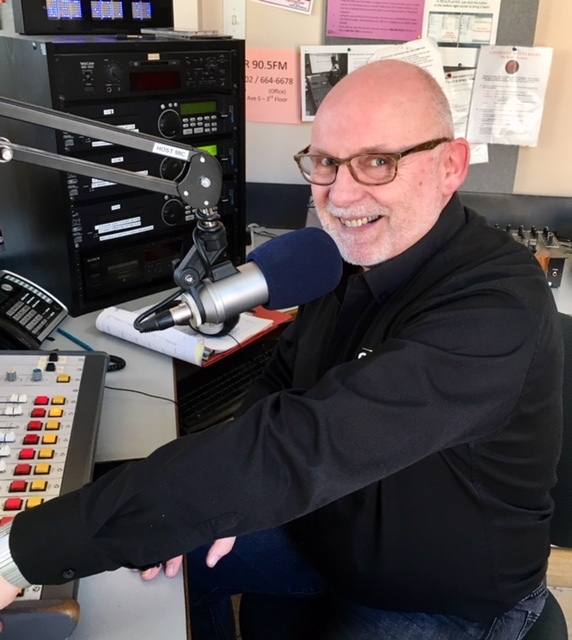 As an on-air volunteer, you'll probably recognize Guy as the host of So Many Roads every other Wednesday, and he has also been behind the scenes as a Member-At-Large on our Board Of Directors for over four years. Guy also MCs lots of events for us, namely the Roots Series at The Bassment, but he’s an avid supporter of live music, so you can often see him attending shows at various venues around town. Not one to limit his community involvement to CFCR, Guy is also a Board Member at the Saskatoon Jazz Society, SPCA, and is the former Broadway Theatre President! But with all these valuable contributions, possibly Guy’s greatest achievement is as a raiser of funds, single-handedly bringing in over $10,000 (!!) towards our FM-Phasis Funding Drive in his six years as the alternating So Many Roads host. For most (if not all) of these years, Guy has raised the most money of any single host at the station, so we figured it was high time we gave him a more public “Thanks!” and asked him a bit about what makes him tick. Through being in the music business at the Broadway I would guess. My wife bought me a guest host thing at a silent auction to do the Swing Shift show. My first one was March 9, 2009. I did the evening blues show once in 2010 and started doing the every second Wednesday So Many Roads on April 13, 2011. I have always been a playlist guy (editor's note: New nickname idea - "Playlist Guy"?) and have enjoyed making them for friends over the years. What better way to do playlists for friends than to have a radio show? I think the station plays an integral role in the music and arts scene in our city. On one of my first few swing shift shows I did my intro to the show and hit the play button on my computer and nothing happened. Being a rookie, I had no idea what was happening. I turned the mic back on to speak and then proceeded to yell for (CFCR Station Manager) Neil to come and save me. It was just an in-pushed button. Since then I have tried to get through my shows without tech difficulties and on occasion I do. I would have to say the 10am to noon slot for So Many Roads but I also enjoy Hot Buttered Soul and many of the Green Eggs & Ham shows. I have been really enjoying Steph Cameron lately. I go to see her when I can, and she is a regular addition to my radio playlists. I like my pizza with everything except olives which make me…. Best movie lately would have been Wind River and book would have been Natural Born Heroes. Lyle Lovett - "This Old Porch"
CFCR would like to give thanks to Nino's Restaurant for sponsoring "Get To Know A CFCR Volunteer!" And, if you just want to help out in the community or around the station without hosting a show, shoot a message to CFCR’s Volunteer Coordinator at volunteers@cfcr.ca, or call at 306-664-6678, and the next time the station needs an extra set of hands, you’ll hear from us.